We know that the speed of light depends on the density of the medium it is travelling through. It travels faster through less dense media and slower through more dense media. When we produce sound, a series of rarefactions and compressions are created in the medium by the vibration of the source of sound. Compressions have high pressure and high density, while rarefactions have low pressure and low density. If light is made to propagate through such a disturbance in the medium, does it experience refraction due to changes in the density of the medium? Why don't we observe this? Actually this effect has been discovered in 1932 with light diffracted by ultra-sound waves. In order to get observable effects you need ultra-sound with wavelengths in the μm range (i.e. not much longer than light waves), and thus sound frequencies in the MHz range. 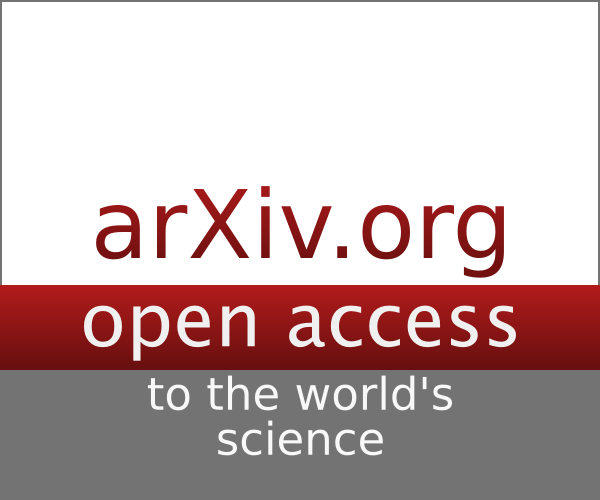 Abstract : This article describes the main optical properties presented by solid and liquid media, subjected to ultra sonic elastic vibrations whose frequencies range from 600,000 to 30 million per second. 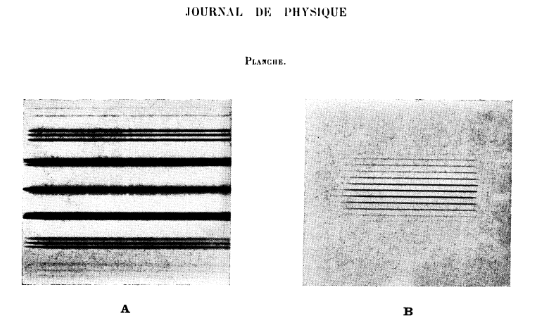 These ultra sounds were obtained by Langevin's method using piezoelectric quartz excited in high frequency. Under these conditions, and according to the relative values of the elastic wavelength dimensions, the wavelengths of light, and the opening of the light beam passing through the medium studied, different optical phenomena are observable. In the case of the smallest elastic wavelengths of up to a few tenths of a millimeter, grating-like light diffraction patterns are observed when the incident light rays run parallel to the elastic wave planes. 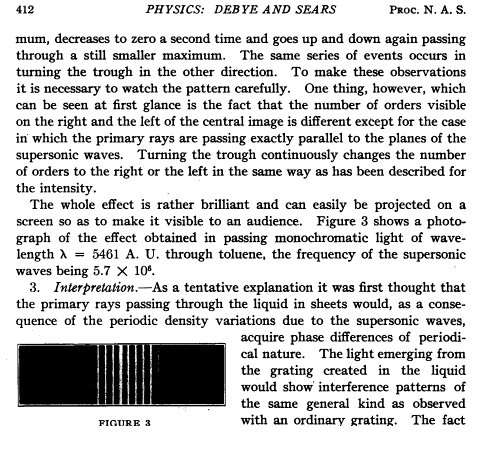 A theory of the phenomenon of the diffraction of light by sound-waves of high frequency in a medium, discovered by Debye and Sears and Lucas and Biquard, is developed. I have seen it with standing waves in water, a PhyWe demonstration experiment. The frequency 800 kHz, which gives a distance between nodes of about a millimeter. The standing wave is in a cuvette, between the head of a piezo hydrophone transducer and the bottom. When looking through the water, one sees the varying index of refraction as a "wavyness" of the background. Sources of loud sounds typically cause other phenomena that obscure this. Combustion creates light and heat, and rapid pressure release can force water in the air to become opaque. Even with all that, it is possible to magnify the effect using distant point light and either by merely observing refracted patterns or creating a setup where half of the refocused image is blocked. Using the second technique it is possible to observe clap of hands. You can see the effect of density change on refractive index due to heating of air. For a simple example, light a candle and look through the air column directly above the flame. The flame heats air which rises, but the flow is turbulent, so you'll see objects on the other side of the air column shimmer as the stream of hot air wavers from side to side. You can see this effect when you look across a paved surface on a hot sunny day. You won't see this effect with sound, at least not at typical listening levels because the density changes are too small (as noted in one of the other answers). Not the answer you're looking for? Browse other questions tagged visible-light speed-of-light acoustics refraction or ask your own question. Why does sound travel faster in iron than mercury even though mercury has a higher density? why does the optical media have different refractive indices? What exactly are light waves? Why doesn't a medium travel along with the wave propagating through it? Why does the speed of sound relate to temperature in increasing altitude?